L'Escala is one of the major towns on the Costa Brava and is famed for its anchovies. It is also the location of Empuries, a large ancient Roman town with Greek origins that sits just outside L'Escala. The town is sort of into two parts - the original fishing town/village which is to the north and the more modern estates of Riells that cluster around the southern beach of Riells and run down to Montgo. The two blend into to one another but there is a strongly different character between the more holiday focused modern town and the more work focused old town centre. For this walk we started at the fringes of L'Escala old town as we really wanted to go north past the Empuries archeological site, on to St Marti d'Empuries and then onwards along the coast. The path is made for a Sunday stroll with tarmac underfoot and paths across and around the dunes on purpose-made wooden paths. This strollers path runs all the way to St Marti and is perfect if you have a pushchair or are just looking for a passeo. 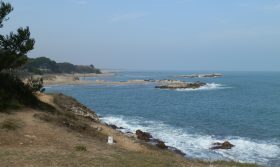 As mentioned we started at the the outskirts of the town and the path follows the coast past low rocky cliffs and then around to the four or five small sandy bays that lay nestled under the dunes, with rocky outcrops reaching out into the sea. 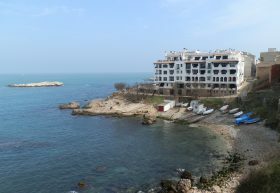 We walk past the Hostal d'Empuries hotel and restaurant where it can be pleasant just to while away the time watching the sea and the passersby. Immediately after the Hotel is Empuries. Founded by the Phoenicians and then extended by the Greeks and Romans, you can see the layout of the Roman town from the path as you pass, but to visit properly you have to go inside to the museum. You can tell from the outside that the town was very large, but in fact the part you can see from the beach path is only about one third of the entire site. 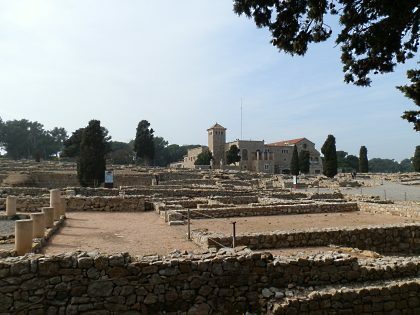 Empuries was a very important trading town and would have been comparable size and importance to Tarragona and Barcelona during the Roman period. The word Emporium for a large shop shares the same route as Empuries, and ancient writers mention the city and its contribution to the Punic Wars, giving some idea of the importance of the city to the Roman Empire. After the Romans left, Empuries remained the chief town in Emporda and was the seat of the counts d'Empuries until the 10th Century, at which point raids by Vikings(!) and muslim navy led to the town being abandoned in favour of Castello d'Empuries to the north. Just after last houses of Empuries, if you look to the sea you'll see the remains of the ancient Greek/Roman port wall standing on the beach. Originally, Empuries would have had a very impressive harbour. The position of the walls relative to the sea level also show how changing coast lines have directly affected the history. At one point Empuries and Sant Marti were on an island surrounded by water. But drainage, sedimentation and changing sea levels now mean the surrounding area is fertile farmland. After the port, the path continues up to St Marti d'Empuries, a small walled Catalan village. We walk up into the village to see the church and around the old houses, and even in early March it's teeming with people visiting the restaurants. Behind the restaurants, you pass the remaining walls of the town. Being on the sea, Sant Marti would have been at risk of attacks from pirates. From there we head out towards the long broad beach that extends all the way along to Roses about 20km to the North, taking in the path we walked by the Aiguamolls and still going round. 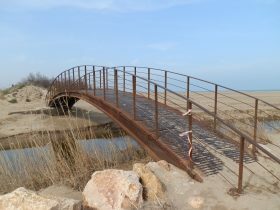 To reach the main beach you have to cross a metal bridge over the river. We walked along the beach watching the campsites to our left. 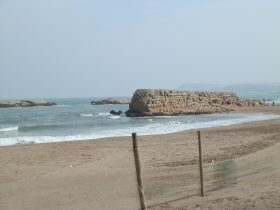 There are two very large campsites that run along the beach. 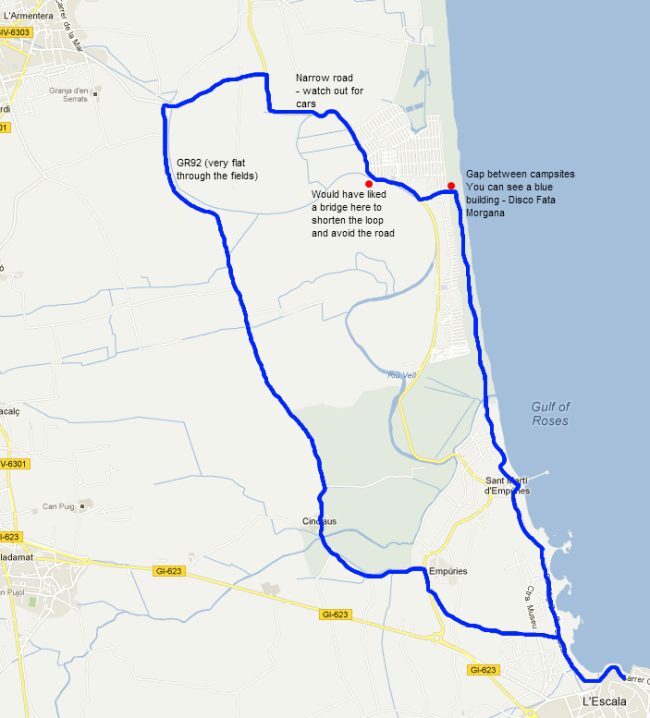 The first is the Balena Allegre (Happy Whale), and the second Les Dunes. In the summer they would be full with people, but out of season we're almost the only people on the beach. Just a handful of long-distance walkers making the hike down to L'Escala walk past. The only problem though is the size of the campsites. On the map there's a break point between the two campsites, otherwise you're hemmed in all the way almost to Sant Pere Pescador. The challenge from the sand is working out where Balena Allegre ends and Les Dunes begins. Fortunately we find the right spot. As you're walking there's a big blue building labelled as the Discoteque Fata Morgana (a Fata Morgana is a mirage). The path runs from the beach up by the side of the disco and from here we're out onto a small narrow road. There's a path behind the crash barriers that's used by cycling campers in the summer. We walk north, hoping to find a way to link to the GR92. There's a path marked on the map that reaches down towards the road. Unfortunately, to reach the path you have to cross a broad stream and there's no bridge link. The only place to reach the GR92 is to go further north past the fields of espaliered fruit trees. The only problem is the path runs out and you have to follow the road which is precariously narrow with little space to pass pedestrians. Fortunately it was quiet and we walked on to reach a left hand turn past the big house of Cortal Gran. From this point the walk is very very flat and relatively long, through the fields and past more fruit-trees with relatively little variation. After a couple of kilometres the path finally arrives at Cinclaus - a small nest of masias with a chapel built at the site of a former castle, which itself was built on the site of a former Roman villa. 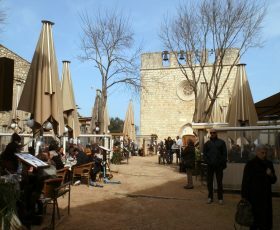 Like many old masias, one has been converted into a restaurant and families are just leaving after their Sunday lunch. Cinclaus is also the point where the GR1 path from Finistere in Galicia meets the GR92 long distance coast path. 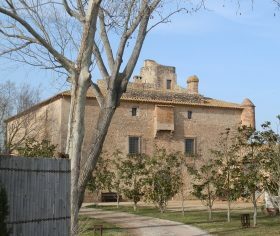 We walk back to L'Escala past the riding centre and up, off the road and past a farm. From the crest of the hill we realise that we are right next door to the ancient walls of Empuries - not the part we walked past on the seaward side, but a different part of the town. The walls are 3-4m high and several hundred metres in length. We can just make out the ampitheatre built outside the walls. We follow the path down and walk past the entrance to the Empuries Museum/Archaelogical site, then back along the beach to L'Escala.